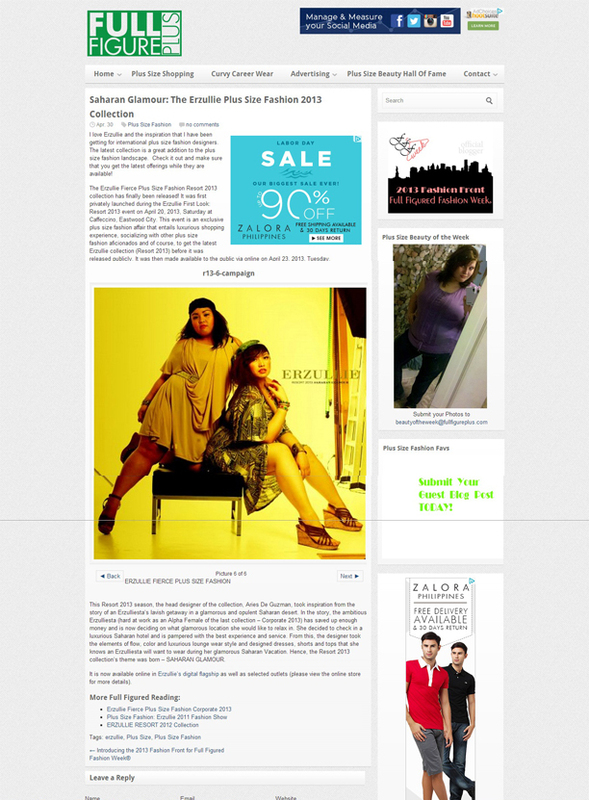 Erzullie Fierce Plus Size Fashion Philippines: PLUS SIZE FASHION: ERZULLIE RESORT 2013 IN FULL FIGURE PLUS! PLUS SIZE FASHION: ERZULLIE RESORT 2013 IN FULL FIGURE PLUS! We would like to thank Mr. Glen Johnson, MBA, for featuring the Erzullie Resort 2013 collection in Full Figure Plus! We are very grateful for this honor for the brand to grace the digital pages of your prestigious Plus Size blog! Congratulations also for Erzullie Icons and Plus Size Models, Kat Lopez and Loren Monares, for being featured in the international plus size blog-o-sphere! Get the featured clothes online or visit the Erzullie Pop Shop on May 18, 2013, Saturday (6:00-9:00pm) at the Caffeccino Function Room, Caffeccino, Eastwood City, Quezon City.